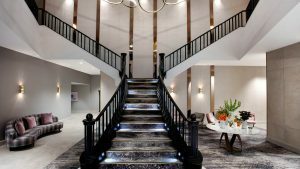 Located in the city’s historic Old Town, Hilton Edinburgh Carlton is an iconic hotel on the famous Royal Mile, directly above Edinburgh Waverley train station. We have various room types available to suit all needs. Select an executive room for access to our Executive Lounge or choose from one of our sumptuous junior suites. Enjoy a fine dining experience in our Marco Pierre White Steakhouse Bar & Grill or simply relax in the sophisticated surroundings of our Nineteen Hundred Bar & Lounge. 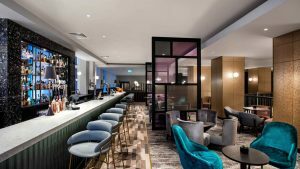 This contemporary space offers bar food and afternoon tea plus craft beers, fine wine and an extensive choice of spirits and cocktails or for the more health conscious you have the option to workout in our extensive fitness suite. Our 7 event spaces are quiet, calm, spacious & stylish. 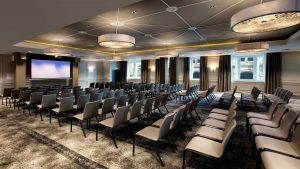 Catering from 2 up to 250 guests in our grand ballroom, with spectacular views across Edinburgh, makes us the ideal venue for conferences, meetings and events. Discounted car parking is available at nearby New Street Car Park.